This month’s Get To Know band has been well worth the wait. The band you need to get-to-know is Kash’d Out. Greg Shields, Jackson Hauserman, and Josh Saldate, former Producer and Engineer at Sound Lounge Studios, formed Kash’d Out in 2014, out of Orlando, FL. Completing the lineup are Joey Brohawn, Marshall Hearne, and Nick Gudzan. The five-member band may sound young, after only four short years together. However, their sound is reminiscent of a group that has been together for many years. The band was signed to Law Records over a year ago and this jump has helped promote the band significantly. 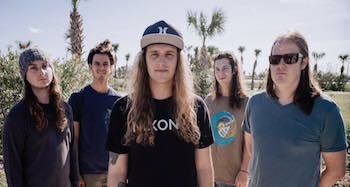 They have been out on the road in support for Ballyhoo!, Pacific Dub and most recently (and notably) last year’s Pepper/Less Than Jake tour. Currently, they are on the None Escape The Law Tour with fellow label mates Seranation and Tunnel Vision. Dates for this tour can be found below. The band’s first EP is no holds barred, which is something unheard of with most Extended Play releases. With tracks like Feel Good, a song that truly does what it says - makes you feel good. It’s brimming with catchy choruses, that never leave your soul. I see no better way than to start your day with this song. Greg Shields’ voice can literally trap you in a state of good vibes (who wouldn’t love that?). Another standout track on the album is Driftwood. A slow melodic vibe that is relatable to everyone from all walks of life. Those of us in the ‘trenches of LIFE’, who are trying to find our way and need a little uplifting to help us realize life is worth the pain sometimes. Kash’d Out followed up that EP with their first full-length album The Hookup. This album is 14 songs of pure awesomeness. The album has many layers to it stretching from simple good vibes, relationship up and downs, and nothing but your classic, ‘smokin’-the- good-stuff’riffs that fans are used to. “Yes I” is a perfect sing along song for when you are passing around the planets true remedy to get through the day. Even while jamming out to the relationship-type tracks like “Fireproof”, “Baby Don’t Go”, and “New Love” you are still kept in positive vibes. The band, in my opinion has perfected the art of ‘the hook’. Through every song - from their first EP to The Hookup, I am consumed with the fun and catchy choruses they bring. It is an insult to really say what my favorite songs on the album are because, quite frankly, I don’t skip one from start to finish. When you start to peel the layers back from the album you will come to find that the album will make you appreciate each day. This is especially true with the song “So Blessed”. From the second I started listening to this album, I can honestly say it makes for an incredible mediation-type feel. Howi Spangler from Ballyhoo! makes an appearance on the track “Being Easy”. It is a must-listen, especially if you are feeling stressed out. I would not be at all surprised in the next few years this band will be headlining festivals alongside some of the genre’s powerhouses. Kash’d Out quite frankly is like a 1000 suns in a glass jar - their shine is bright. Pick up their music, listen to it when you wake up and guaranteed good vibes will follow the rest of the day.